Crowns have the look and function of natural teeth. Your dentist will design them to match the size, feel, and bite of your existing teeth. They will fit perfectly and you don’t have to worry when you eat. Crowns fix smiles! The color, shape, and size of a crown can be designed to improve your beautiful smile. Crowns are inexpensive! They can help you avoid other dental procedures that cost much more money. Crowns can be used on exceptionally large cavities and thus eliminate the need for possible root canal procedures. Crowns restore strength and function! 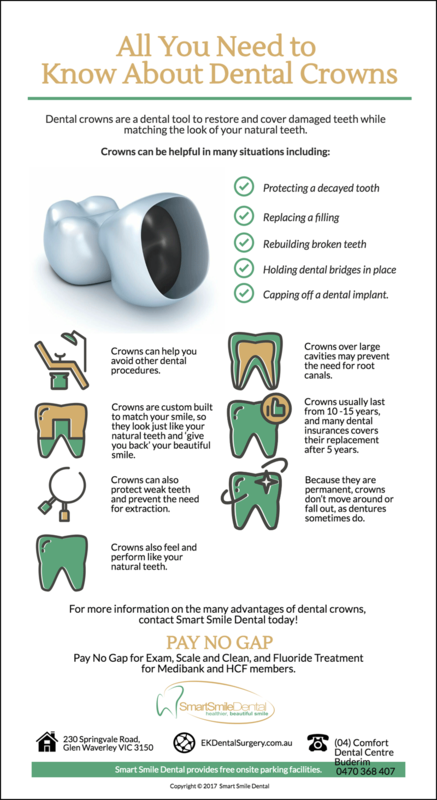 Crowns can protect weak or damaged teeth and eliminate the need for them to be removed. Crowns stay put! Unlike other dental appliances crowns do not shift or break. Other appliances can crack, drop out, or be lost, but once crowns are in, they stay in place! Longevity! Crowns regularly last from five to ten years and they sometimes last even longer. Even better? Often, insurance plans cover crown replacement after five years. Dental Crowns can help protect and strengthen your bite, and make your smile complete and attractive! Visit Smart Smile Dental to learn more! For high-quality dental crowns in Deer Park, call us today on (03) 8390 5778.